Newly acquired for the 2018 season, our 25 foot Anderson Offshore is a true offshore workhorse. Custom built by renowned Vancouver Island welder Lawrence Anderson (known for his work with Lifetimer Boats), Saturday Pants is a unique vessel designed for a diverse array of tasks, but especially thrives in the heavy-weather, offshore environment. While almost perfect as a platform for all-weather fishing, it also functions well as a fast water taxi with its deep, spacious cuddy cabin, with seating for up to 6, and a head for longer trips. 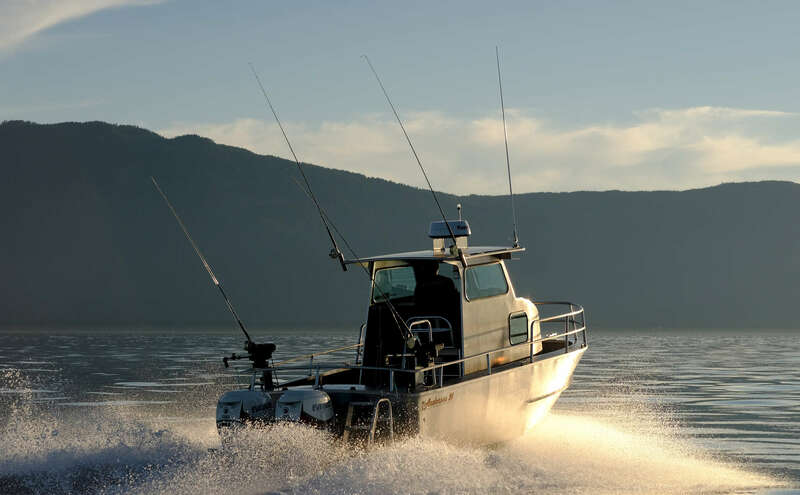 Top-of-the-line, brand-new radar, navigation, and electronics, plus a twin outboard configuration allow her to venture anywhere while maintaining safety as our number one priority. Our passenger capacity is 8, but we run with a maximum of 6 plus gear. For fishing trips, however, we limit passengers to 4. This vessel is insured and registered as a commercial passenger vessel with Transport Canada. We are proud to have one of the most capable mid-sized work/patrol Rigid Hull Inflatable Boats in the Pacific Northwest...a bold statement for sure, but performance speaks for itself. Scooty Puff is a Gemini Elite Patrol - 22'6 foot, 300hp with reinforced beaching keel. This boat will do 50+ knots and is uniquely suited to covering ground quickly and effectively. Top-of-the-line navigation, electronics, communication, and safety equipment ensure that the thrill of this boat ride will be matched by its safety. Our passenger capacity is 10, but we run with a maximum of 7 plus gear. This vessel is insured and registered as a commercial passenger vessel with Transport Canada. Simon Hayter has been driving boats his whole life in all kinds of seas, chasing all the species of the Pacific. He has his commercial 15-tonne Skipper's licence as well as other related marine-operator qualifications. He is also a Search and Rescue Technician with the Royal Canadian Marine Search and Rescue and a Primary Care Paramedic with the BC Ambulance Service. Simon holds the elite RHIOT certification from the Canadian Coast Guard.